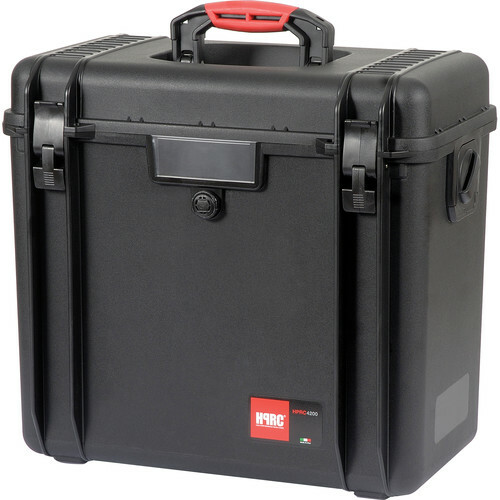 The 4200E Hard Case without Foam from HPRC (High Pressure Resin Cases) is an ATA 300 rated case that is meant to hold your audio, video and photo gear in safety. Specifically, it is excellent for standard LED lights and stands. This case is empty and does not contain any foam or dividers. The virtually unbreakable hard resin composition is supported on the inside by a neoprene O-ring that keeps it both air and waterproof. The addition of durable aluminum enhances the overall strength of the case. Due to its rugged construction, it can withstand the rigors of travel and impact. It's also able to handle drastic temperature swings and the corners have been reinforced to withstand bumps and the impact experienced during travel. The folding top handle is made of polypropylene and SEBS rubber for a soft but rigid grip. The Roll Body System (RBS) allows use of an optional shoulder strap to comfortably follow to your body movement while walking or running. It also meets current international specifications for carry-on luggage. The case is opened on the top for easy access to its contents and secured by a reinforced double-hinged latch system. The built-in air pressure valve offers additional protection to the contents during long trips. A molded-in hasp allows use of an optional padlock. Backed by its lifetime replacement warranty, the 4200E will provide you with a reliable and practical way to transport your gear. Watertight; acid-, corrosion-, UV-, crush-proof case for video, audio and photo equipment and accessories; tested to withstand drops and impact. Excellent for LED lights and stands, but apt for all audio, video, and photo equipment. Roll Body System (RBS) allows an optional shoulder strap to follow the natural body movement while walking or running. Double hinged locking system for increased safety and security and a molded-in hasp allows for optional padlock. -IP67 Military Standard against the intrusion of solid objects or dust, accidental contact, and water. -STANAG 4280 and DS 81-41 are NATO equivalents for military specifications for standardized endurance and quality tests designed to simulate extreme situations.